For more information, select from the specific items below. Hawkeye is state of the art racing pigeon software, making use of menus, speed buttons, and wizards. Software development commenced in 1990 with the first version released to the public in 1992. Always looking to enhance the product, Comproware continually tests and improves new features with feedback from the racing pigeon community, in conjunction with the latest in IT technology. Hawkeye can handle a substantial amount of data. Under Windows 2000, NT, XP and Vista, Hawkeye can store in the order of a billion records of pigeons, a billion race records, medical records, etc. Band - Union, Letters (Prefix), Number and Year. Second Band for double-banded birds. Fully configurable Color and Strain. Fully Configurable Status - Racing, Team A, Team B, Young Bird, Young Team A, Breeding, Archive, On Loan, etc. Two JPEG images for each bird, e.g. Body and Eyeshot, etc. Remarks - As many comments as you wish can be stored. Distance - can automatically be calculated from GPS Longitude and Latitude coordinates. Training Toss or actual race. Times & Dates - Liberation, Clocks Set, Checked, etc. Winning velocity - Loft, Club, Fed, Union, Combine (last 3 can be changed to whatever the user prefers). Position earned - Loft, Club, Fed, Union, Combine (last 3 can be changed to whatever the user prefers). Points earned: Loft, Club, Fed, Union, Combine (last 3 can be changed to whatever the user prefers). All Reports and Pedigrees can be exported to PDF, HTML, TIFF, JPEG, PNG, BMP, Word (RTF) or Excel. 4 Pedigree styles, color, with pictures, some with user defined logo. Progeny Analysis - Progeny, Half Brothers and Sisters, Full Brothers and Sisters, Grandchildren. Race Results - Grouped by station or bird. Performance Report - Performance analysis. Race Entry Form - Make your own custom race entry form, or use an existing form. Print out breeding cards for the loft. Bird checklists for use when medicating, etc. 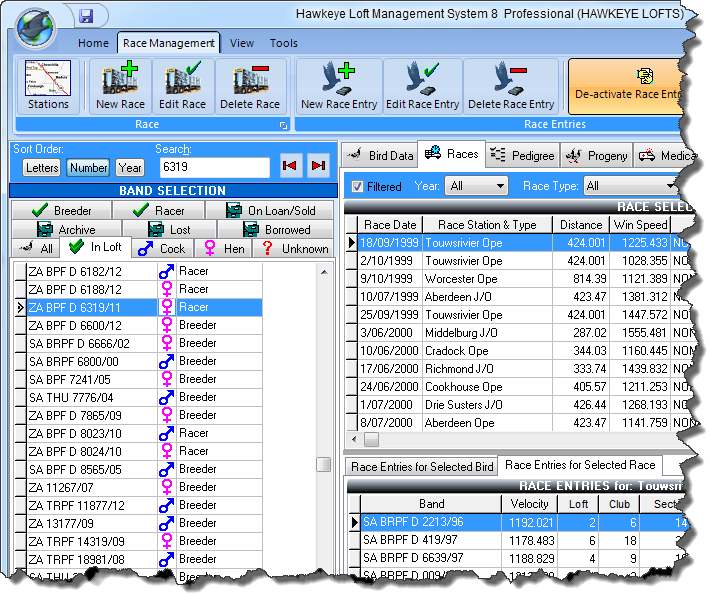 Pigeon Filter System - Hawkeye has a powerful filtering system. You can sort by a variety of criteria. Sorting - Sort by letters, numbers or years. Band Management - Add all purchased bands beforehand and assign them as required. Group Save - Combine any birds together, i.e. Sale Birds and recall them with the click of a menu item. Graph Analysis - Distribution analysis on Color, Strain, Year, Owner, etc. Speed Calculator - Taking into consideration clock win/lose time, etc. Symptom Searchable Disease System - User can build up a database of possible diseases, symptoms, treatment, preventative treatment, etc.